There are some definite perks to our lifestyle, like earning enough hotel and travel points that we get a huge break on vacation costs. We also get a chance to stay at resorts that would otherwise be too pricey. One fun perk is tied into our transportation. While we do travel around in the truck, a rental car is often a must once we are set up for a show. I can tell you that we have rented just about everything under the sun. I am partial to a Chevy Impala, the trunk is huge!! Every so often we get something a bit different, like a BMW or a Smartcar. Well this week’s rental in very different, it’s a 2013 Ford Mustang convertible in bright red. While I would never want to drive this on a daily basis the Stang sure is fun. 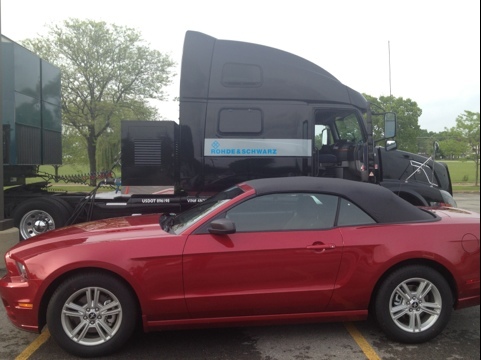 This entry was posted in Life on the Road, Travel Life, Travel Tuesday and tagged cars, ford mustang, ford mustang convertible, Ford Mustang Rental, Rental Car, travel, Travel Tuesday. Bookmark the permalink. Oh boy!! that looks like FUN!! I bet Pippi’s ears are really flappin..in the wind!! Have fun with it.